This week, the Centre for City Ecology and Toronto Park People hosted a free public talk with Ryan Gravel, a senior urban designer with Perkins+Will who helped to lead the early design work on the Atlanta BeltLine. The BeltLine is an ambitious $3 billion public works project that is transforming a 22­mile loop of a former railroad corridor into a linear park circling downtown Atlanta, GA­­ incorporating transit, cycling, and pedestrian trails and connecting diverse neighbourhoods and business districts. The project not only introduces a significant area of new park and public space in Atlanta, but will expand transit service and prompt transit-oriented development in adjacent neighbourhoods. During the talk Ryan spoke about the BeltLine’s beginnings–how his semester abroad in Paris prompted him to re-think the connection between infrastructure and our way of life. He brought what he learned back home and developed the idea for the BeltLine as part of his 1999 thesis project. Ryan envisioned a catalyst infrastructure project that would spark healthy, vibrant, livable development by breaking down the barriers that silo transit, open space, trails, housing, economic development, and the environment. Through years of local advocacy, organizing, and community consultation, the Atlanta BeltLine developed into what it is today–one of the most comprehensive urban redevelopment projects in North America. Ryan is now an urban designer with Perkins+Will and is helping to lead the design work on the Atlanta BeltLine. This comprehensive thinking is what has enabled the Atlanta BeltLine to achieve support from a range of government agencies, private interest, non-profit organizations, and community members across the political spectrum. By incorporating connectivity, economic development, health, and environmental considerations, the Atlanta BeltLine developed into a strong concept around which communities and governments could come together. It will create a central loop of cycling, pedestrian, and transit connectivity around downtown Atlanta, and provide connections to an emerging regional trail and transit network. How can this kind of integrated thinking about connecting corridors be adopted in the Toronto context? Look at the map above (click for a larger view), showing Toronto’s existing and proposed Greenways alongside the area’s rapid transit network. 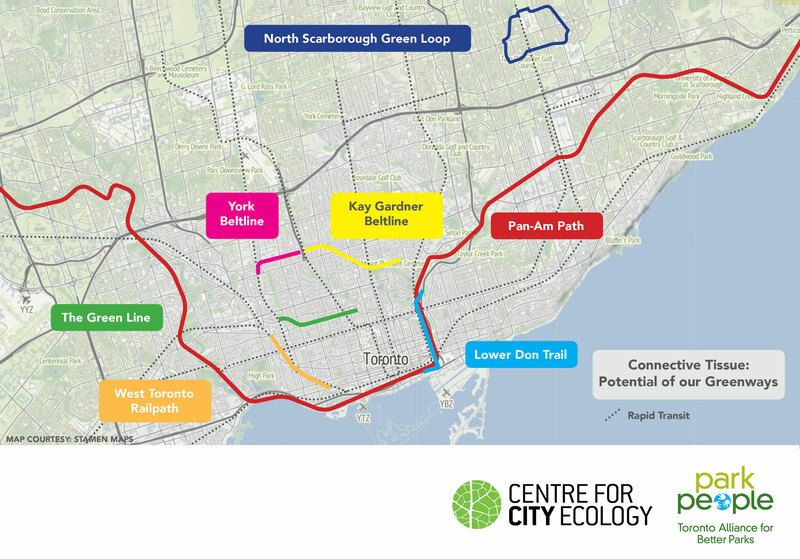 Toronto’s real and proposed greenways highlight the potential of complete thinking about these spaces to facilitate new connections throughout the city–between and across neighbourhoods, to and from key destinations, through and around natural features and new developments. Thanks to all who attended the talk. And for those who missed it, the full presentation and screen cast is available below. The Atlanta BeltLine: A Talk with Ryan Gravel from on Vimeo.